Across all home types from this time last year, the median sold price increased 11% in the Denver metro area, and prices have never been higher. Attached single-family home values are up 13% year-over-year in the metro area. Detached single-family home values are up 10% year-over-year in the metro area. Year-to-date, there have been 3% less listings in the metro area than there were last year, which brought our inventory levels to a new record low. The median Days On Market for listings in the city of Denver was a mere 5—homes in Denver have never sold more quickly. In May 2016, homes sold for an average of 101.2% of the list price in the city of Denver. Denver residential real estate has appreciated more than any city in the country since the Great Recession (prices have doubled since 2008), and people have begun to ask if Denver’s single family residential real estate market a bubble. According to economists, the answer is no. The Denver metro area population is growing faster than any other metro area in the country, and that growth actually accelerated last year. Rapidly increasing demand for single-family housing combined with a decreasing supply of it is driving the rise in prices. There are significantly more people moving here than are leaving, and builders aren’t building enough single-family homes to keep up. According to the Denver Post, Colorado is 55,000 units short of what we need to keep up with our population growth, and we would need six(!) 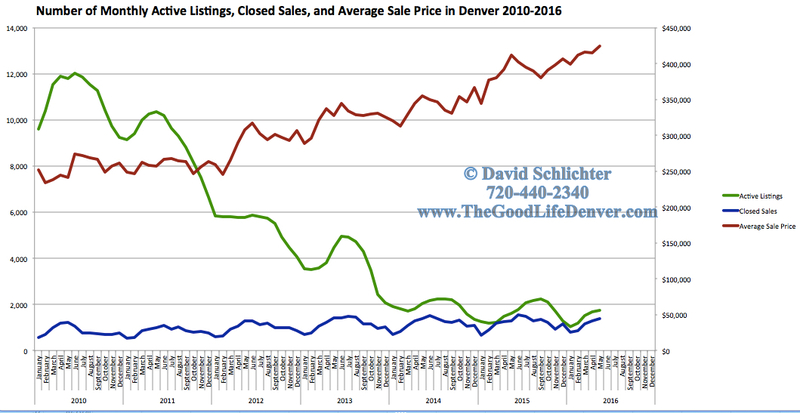 times the number of homes that are currently for sale in Denver for the market to become a balanced market. So, even if things improve slightly—if builders pick up the pace of new housing starts, population inflow slows (though this is not what the data suggests is happening or will happen), or more sellers put their homes on the market, the market still has plenty of room for additional significant price appreciation. Do I think that 10-12% year-over-year appreciation is sustainable indefinitely? Definitely not. At a certain point, the rapid price appreciation will start to make other cities more attractive alternatives because they will have a lower cost of living than here, and our rate of appreciation will begin to slow. But the mountains aren’t going anywhere. The vibrancy of the city–from the dining scene, to the brewery scene, to the public transportation system–has only gotten better and better. The local economy is one of the strongest in the country. People love Denver, and are willing (and will continue to be willing) to pay a premium to experience all that it has to offer. So is it a good time to be a buyer? I’d still argue yes. In spite of the bidding wars and low supply, with room for significant appreciation and interest rates at historic lows, it is still a great time to be a buyer. Is it a good time to be a seller? Indisputably. Prices have never been higher, supply has never been lower, and the median Days On Market in Denver has never been lower. Contact me today if you would like to discuss the Denver real estate market further or are interested in selling or purchasing Denver real estate.